Yesterday was travel day. Bought gas for the rental car. They make it very painful for you to bring it back empty. We had lunch with Vicky at Friendly’s in Stoneham. Another New England tradition. We arrived in plenty of time to turn in the rental car. Pointed out the damage to the right door. Filled out accident report. Check-in agent said not to worry that we had damage insurance so no issue. Checked out bags and got through security. We had one last Dunkin Donuts iced coffee. American Airlines changed gates on us with bothering to tell us. the hint was no aircraft at the gate. Then we learned that flight was delayed. AA didn’t give a reason. Later, we asked a stewardess. She said air traffic issues. So finally we were wheels up one hour later than scheduled departure. It was a pretty comfortable flight except for the jerk in the window seat next to Paula. First he asked her if she would like to switch seats. Paula politely said no. After takeoff he had to get out to get his tea and talk with some of his travel companions. Then he proceeded to take his shoes off and rub his feet. Stinky feet are not a good thing. Stewardess treated us good. We got discount on the sandwiches. She gave me two Chivas nips for the price of one. So I was suitably medicated. Inflight WiFi was out of service. Oh well, saves me $15. I had sent a text to Mike before takeoff to let him know about the delay. We got into LAX at about 8:30PM. Struggled to find our bags. Announced that baggage on carousel 2. 15 minutes later no more bags coming down the chute and no bags for us. Sigh. I head over to the baggage service office to make claim. Long line and only one staff person taking the paper work. Called Mike to let him know of delay. Paula finds our luggage on carousel 3. No announcement, no sign. Totally pissed at this point, but we had our bags. Time to call Mike and get him to pick us up. Pickup traffic at LAX was AFU’d. 9-10pm is a very busy time to arrive at LAX. So half hour later Mike arrives from Cell Phone Lot. Load up and off to San Pedro. Poor Jonathan was not a happy camper. And finally to bed. It was a great trip. We had a wonderful time. I just out yesterday that my friend Dave Eno died of cancer. Strangely enough (or maybe not) I found out by reading about his death on Facebook. Will Facebook begin to replace the newspaper obits? I think so. I look at the death notices in the Boston Globe, but Dave’s obit wasn’t in the Globe,it was in the Lowell Sun. If it were not for FB, I wouldn’t have heard. So what happens to Dave’s FB account after his death? I hope that his family have access so that they can read what has been said by Dave’s many online friends. Dave and I go way back. We worked for 15 years (give or take) doing OpenVMS support for HP, Compaq and DEC. When your cubicles are next to each other there aren’t many secrets. Dave struggled through a nasty divorce back in the late 90’s. His son Daniel was the joy of his life. His ex-wife less so. I was laid off from HP in 2008. At the time, I thought that Dave would get the axe before me. The need for OpenVMS engineers was declining. Dave got the axe in 2009. It seems that these days that corporations try hard to get rid of older employees especially those with health issues. HP was no exception. At any rate, Dave soldiered on with his cancer treatments. In March, he was healthy enough to get down to Florida to visit with his mother. I am sorry that I won’t be able to make the memorial service in June. Rest easy Dave. The pain is gone. Rest in peace, my friend. As many of you know, I am presently back east visiting friends and family. We decided that we would meet with our old neighbor Candee in West Billerica. So we got into our rental car and headed down to Billerica from Andover. 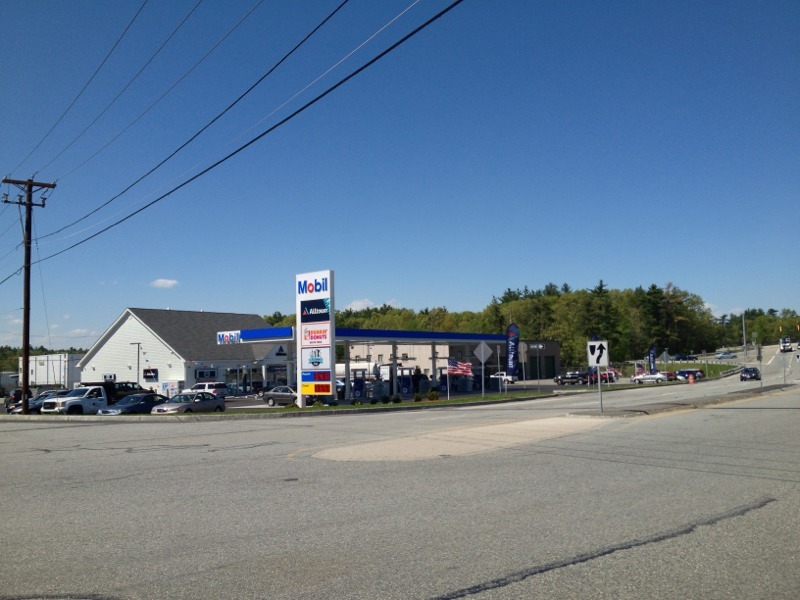 We got off at our old exit from Rte 3 and the first thing that we see is a brand new Mobil gas station with a Dunkin Donuts shop. Now we lived in the house for 28 years. The corner of Treble Cove Rd and Republic Rd had an old abandoned restaurant. So on my way to work, if I needed to get gas, I would have to either go into Billerica center or North Chelmsford to get gas. Need a coffee, go to Boston Rd to the Dunkin Donuts store by Treble Cove Plaza. And another a thing, I forgot about Hay Fever. All of the trees are in bloom and the air is full of tree pollen. Watery eyes, sneezing and runny nose. Three more days until we get back to LA.